Hacket, EDI and Alenko are back in the studio to correct "an oversight." Work on the Mass Effect 3 Extended Cut is proceeding apace with word that Lance Henriksen [Bishop], Tricia Helfer [Number Six] and Raphael Sbarge [who?] have all returned to the studio to record more lines. Sbarge, who actually plays Kaidan Alenko in the game, tweeted about the new voice work, while Helfer said she was going back to the role of EDI today. Henriksen provided a bit more insight, of a sort, into the need for the additional dialog. "They were saying there's a little bit of a problem with the abruptness of the ending. So we did a whole series of things to add to the end of the game, to live up to the quality they've been doing," he told G4TV. "It was just an oversight," he continued. "Usually when a guy loses the game, the game shuts down, it's over, you're done. The players didn't like that." 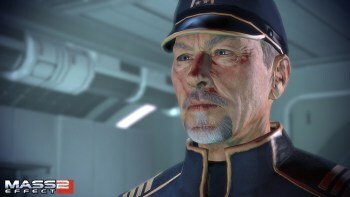 Not that I want to tell Admiral Hackett his business, but I don't think he's quite 100 percent up to speed on why BioWare feels the need to extend the ending to the game. "Losing" is a bit abrupt, yes, but so is winning, which is what has so many players so upset. After committing themselves to a massive, three-game epic and the characters that brought it to life, the wrap-up was ambiguous at best and, in the eyes of its harshest critics, an illogical, impossible, flat-out betrayal of its fans. BioWare has said the Mass Effect 3 Extended Cut, which is expected to come out this summer, will "expand upon the existing endings," but no actual changes will be made. Looking forward to seeing how that works out.